I have mixed feelings about this place, which bills itself as a Southeast Asian (mainly Vietnamese)-Japanese fusion. That alone is a little confusing, because Vietnamese and Japanese foods are opposites in terms of flavor and style. On one hand, the stir-fries are really good and has the taste and texture of a dish made with good wok hei. On the other hand, the soups are pedestrian: bland and uninspiring. My first visit, the soup was basically bouillon and water with noodles in it. 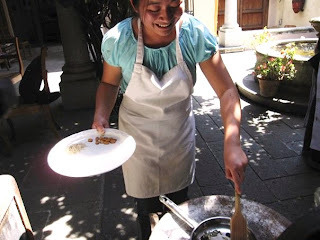 It didn't necessarily taste bad, but I don't want to pay $5-6 for a bowl of hot water and bouillon. Figuring I had ordered poorly, I wanted to give Dao Son another chance. 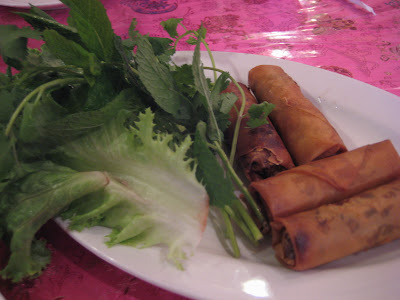 We started with the fried spring rolls. They weren't bad at all. I prefer rice paper as a wrapper versus the flour-based wrappers, which are thicker. The greens were sparse, but fresh. 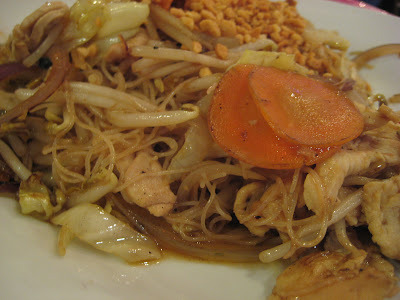 D.'s stir-fried rice noodle with chicken was really good. The noodles were perfectly done and the flavor was rich with onions, garlic, and pepper. The bean sprouts, Napa cabbage, peanuts, and carrots gave it a nice crunch. Wok hei is almost impossible to describe. Per the Wikipedia article, it truly is an "essence" and this dish was chock-full of it. My shrimp tempura ramen was underwhelming. The ramen was a little undercooked, but I'd rather it be undercooked than overcooked and mushy. 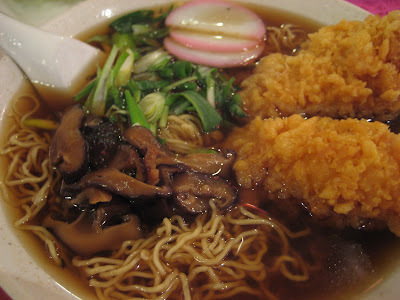 I believe the broth is supposed to be shoyu and mushroom-based, but it was somewhat bland. 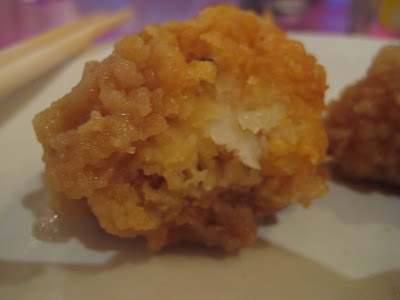 D. suggested the thicker tempura was made that way to absorb the soup, but when the breading became soggy, it was extremely mushy with a mouthfeel that borderlined on nauseating. If I do go back, I'm definitely getting some fried noodles. They had a catfish and eggplant dish that also looked very intriguing. No more soup noodle dishes. I totally agree with you. Dao Son is very hit-or-miss for me. I tend not to like their Vietnamese dishes, which you can get much better at lots of other places. I like some of their stir-fries, but they kind of all taste the same to me. Hi, Howie! The Mister ordered a stir-fry on our previous visit and when he asked for about a "5" spiciness, he said it was disgusting. Like they were trying to disguise any flaws with capsaicin. He can handle heat, but it can't be the only component to a dish. This time, he asked for it to be mild and it was better. I can see where the stir-fries would taste the same... the restaurant's one big flaw is that, despite the big menu, the dishes are one-note. hat's disappointing! Now I know not to bother with the soup noodles. They do have kind of a weird menu, but I like their "red chicken" and the spring and summer rolls. I also got grilled pork the last time - which was ok but not as good as what we had at Saigon.